Yflow® Coaxial Electrospinning & Electrospray Tech. – Isolating an unstable component and minimizing its chances of decomposition under a highly reactive environment. – Releasing with time a substance to a particular receptor. – Reinforcing a material to improve its mechanical properties. – Serving as scaffold for engineering tissues in which a less biocompatible polymer is surrounded by a more biocompatible material. 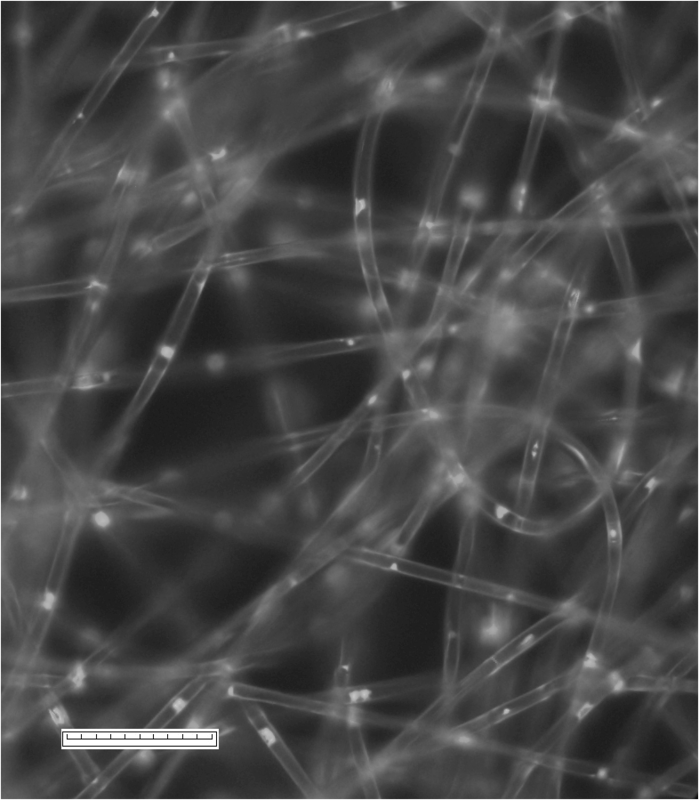 A great deal of studies have been published from many investigation groups related to the co-axial electrospinning process for developing novel structures for new applications. The setup of the coaxial electrospinning process is practically the same than the simple electrospray. The main modification relies on the spinneret: it consists of a couple of capillary tubes where a smaller one is inserted (inner) concentrically inside the bigger (outer) capillary to make co-axial conﬁguration. Both capillary tubes are connected to a respective reservoir independently supplied for a syringe-pump or air pressure system. This system (for example two syringe pumps placed parallel) impulses both solutions to the coaxial spinneret, which presents two inputs. Inside this coaxial spinneret both fluids flow and in the tip of the device it is produced the injection of one solution into another, and can be seen that both solutions are coaxial. The shell fluid drags the inner one at the Taylor cone of the electrospinning jet. If the fluids are immiscible, a core shell structure can be seen. In the other case (miscible solutions) a fiber/sphere with distinct phases is obtained. The process is analog to the simple electrospinning (single jet). 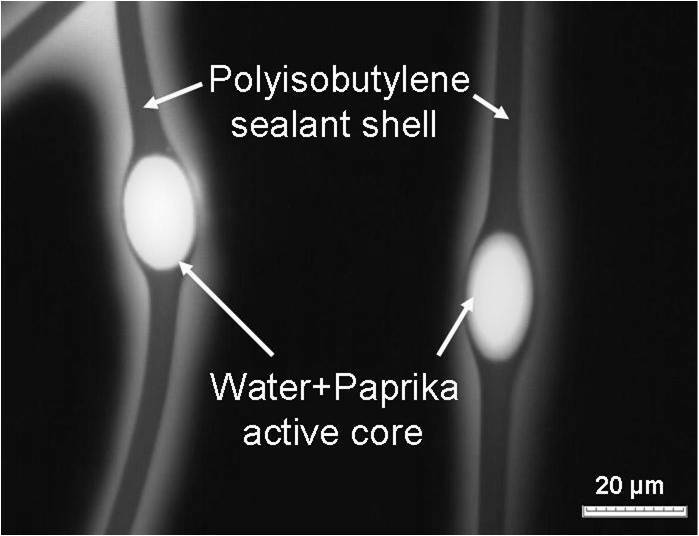 Both polymer solutions are connected to high voltage and a charge accumulation appears on the surface of the shell liquid. 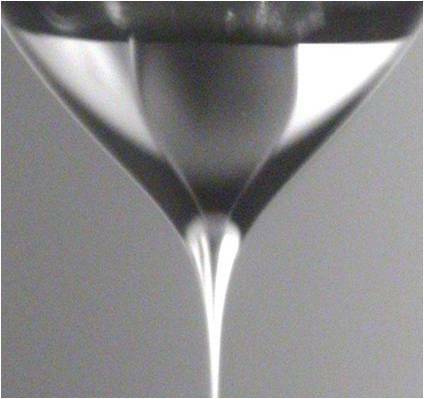 The liquid compound meniscus of the shell liquid elongates and stretches due to the charge-charge repulsion to form a conical shape (Taylor cone) and when the charge accumulation reaches a certain threshold value due to the increased applied potential, a ﬁne jet extends from the cone. The stresses generated in the shell solution cause shearing of the core solution via “viscous dragging” and “contact friction.” This causes the core liquid to deform into the conical shape and a compound co-axial jet develops at the tip of the cones. It is expected that as long as the compound cone is stable, the core is uniformly incorporated into the shell for core-shell ﬁber formation. On the way to the collector, as it happens in the simple electrospinning, the jet undergoes bending instability and follows a back and forth whipping trajectory, during which the two solvents evaporate, and the core-sheath nanoﬁbers are formed. The variables that govern the process and the morphology of the resulting ﬁbers/spheres affect the behavior in the former. Additionally, as the sheath and the core solutions are in contact and undergo the same bending instability and whipping motion, the degree of dissimilarity between them, in terms of composition, and physical and rheological properties, plays an important role in the formation of the composite ﬁber. The viscosity of the shell solution is required to be such that the viscous stress imparted by it on the core is sufﬁcient to overcome the interfacial tension between the two solutions and allows the formation of a compound Taylor cone and a jet from the latter. Accordingly, viscosity of the sheath solution is critical and the shell solution system selected should be electrospinnable by itself to lend to core-sheath structure formation. The requirements for the spinnability of the core solution are not critical because the jet break-up of the core ﬂuid tends to be prevented by the sheath due to strain hardening of the interface between the sheath and the and lesser surface forces acting on the core solution surrounded by the sheath, which otherwise will be higher. The core ﬂuid must possess a certain minimum viscosity if it is to be entrained continuously without break-up. An increase in the core concentration means to increase both the core and overall ﬁber diameters and make decrease the thickness of the sheath decreased, which is due to the same mass of the sheath distributed over a larger core. – Solvent/Solution Miscibility and Incompatibility. 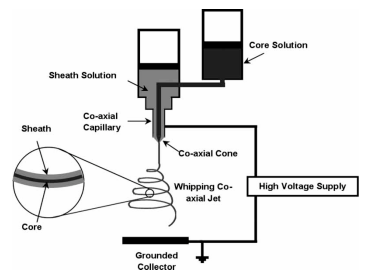 The interaction between the core and the sheath solutions (polymers or solvents) is an important parameter to be considered before selecting the desired set for co-axial electrospinning. 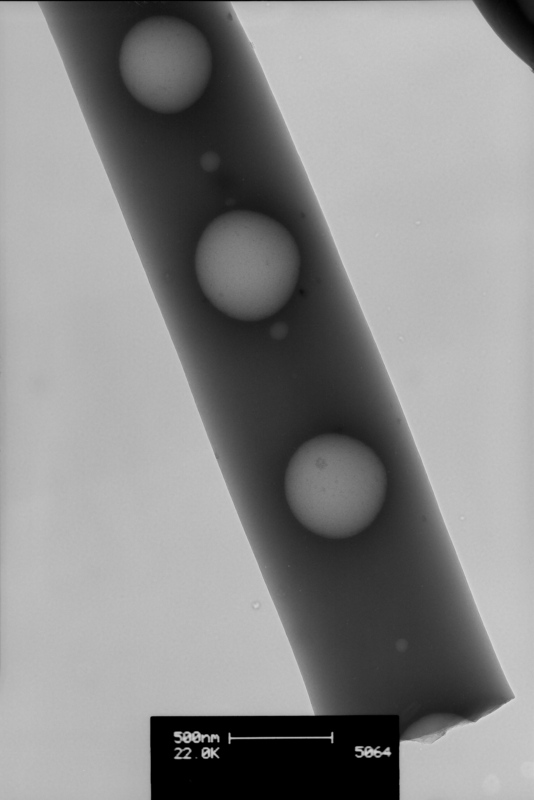 For successful spinning, the solvent in either of the solutions should not precipitate the polymer from the other solution when the solutions meet at the tip of the capillary. In addition, the interfacial tension between the shell and the core should be low for the generation of the stabilized compound Taylor cone. The type of solvent used in the core solution affects on the resulting morphology of the core-shell structure. Solvents with high vapor pressure, which evaporates rapidly (e.g. chloroform, acetone etc. ), creates a thin layer at the interface core-shell when are used in the core, that tends to trap the interior solvent that diffuses out more slowly due to the newly created barrier. When it fully leaves solidiﬁed structure and it creates a vacuum, which causes the core structure to collapse from the round to ribbon-like conﬁguration under atmospheric pressure. Since the stabilized compound Taylor cone and the initial jet are the requirements for the co-axial electrospinning, high vapor pressure solvents may, also, not be used in the sheath solution as they may produce unstable Taylor cones and lead to multiple jets due to fast evaporation. 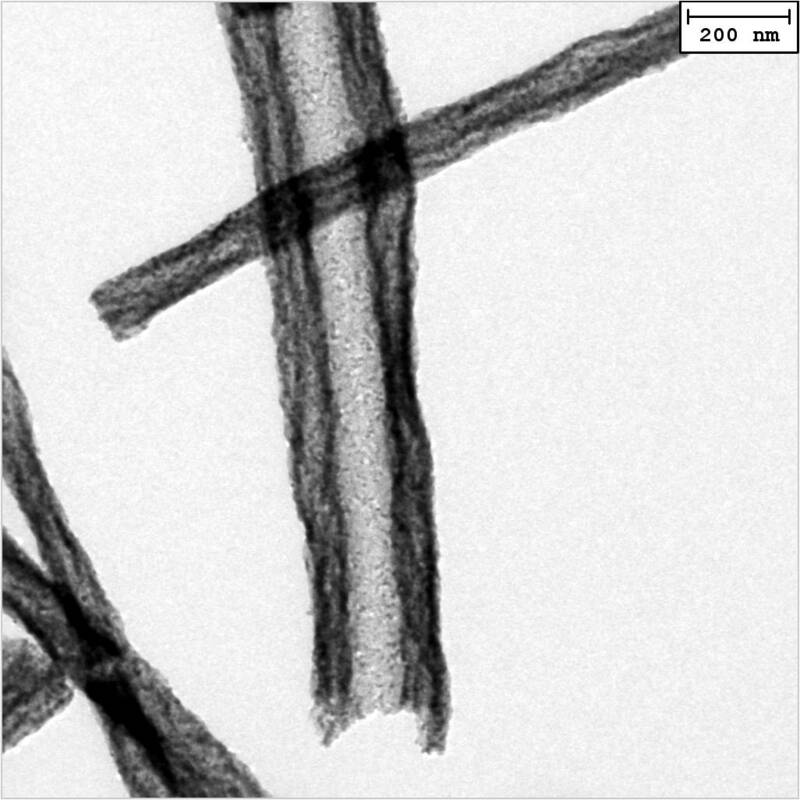 Such unstable Taylor cones can cause the formation of irregular core-sheath structures as well and result in separate ﬁbers from the two solutions. Solutions highly conductive have high surface charge density, which causes an increase in the elongational force on the jet due to self-repulsion of the excess charges under a given electrical ﬁeld, what makes possible to obtain smaller diameter ﬁbers through an enhancement of the whipping action. Conductivity difference between core-shell solutions can also affect core-shell ﬁber formation. More conductive core solution was pulled at a higher rate by the applied electric ﬁeld and caused discontinuity in the core-sheath structure. Higher shell conductivity, on the other hand, would not hinder the process of core-sheath ﬁber formation but would rather result in higher shear stress on the core material and its subsequent elongation to form a thinner core. It is also clear from the studies that even non-conductive or less conductive liquids can be successfully incorporated as the core into a higher conducting sheath. – Shell solution must be electrospinnable for itself. – Shell solution viscosity must be higher than core´s. – Low interfacial surface tension between core-shell solutions. – Shell solution conductivity must be higher than han core´s. Each of these structures has led to different applications and together they have greatly expanded the scope of the electrospinning technology in meeting the needs of the next generation polymer products.